I don’t find this data at all surprising as I think about how I would be approaching the current market… with the short term gyrations and huge moves up and down, often on rumors or innuendos it’s an incredibly difficult market to wrap your arms around if your time frame is longer than 1-3 hours days. The fact that correlations are so extreme (“Lemmings on”!) does not help either. 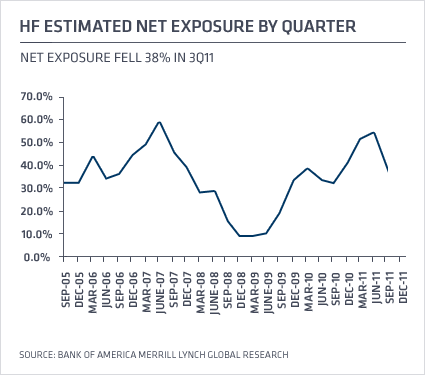 Looks like the hedge fund industry is viewing it the same way, as net exposure to the market has dropped significantly between Q2 and Q3. Frustrated by market volatility over the European debt crisis and uncertain U.S. economic outlook, the so-called smart money—hedge funds—has thrown in the towel for 2011 and pulled out of stocks, according to fund managers, SEC filings and exchange data. Hedge funds have slashed their exposure to stocks—both on a long and short basis—to the lowest level since 2008, according to Bank of America Merrill Lynch analysis of SEC disclosures and NYSE and Nasdaq data. Their net long exposure to stocks plummeted by more than a third, the biggest drop since 2009, stated the report by analyst Mary Ann Bartels entitled “Hold ‘em and Fold ‘em.” Hedge funds are clearly as worn out by gyrating markets as everyone else. This month, stocks have fallen back below breakeven for 2011 as uncertainty over the size of the European bailout grows and a failed bipartisan agreement to cut the U.S. deficit points to more political infighting next year. Hedge funds have paid the price. The HFRX Global Hedge Fund Index—compiled by industry observer Hedge Fund Research—is down 9.9 percent for 2011 through the end of last week. The S&P 500 is still negative on the year—even with Wednesday’s rally—and the majority of global markets are the same. Bartels’ research report also showed that hedge funds raised their cash levels to 6.8 percent. They cut their exposure to the financial and industrial sectors by half. These would be among the hardest hit if the Euro falls apart, sparking a financial crisis that grinds global growth to a halt.